M-NASR’s AWID (Adults with Intellectual Disabilities) area consists of adults ages 18 and over who have an intellectual disability. Participants in this area may include those individuals with an intellectual disability (formerly a cognitive disability), learning disability, behavior disorder, Down Syndrome, Autism, mental illness, those who are emotionally disturbed or adults who may need special assistance to participate successfully in a recreation program. Our Adults with an Intellectual Disability (AWID) is its largest area, and we have programs as diverse as the population that it serves. Each program will help you in different ways, depending on your interests and what you would like to accomplish. We work on social skills, communication skills, life skills, community reintegration and pursuing recreational opportunities. 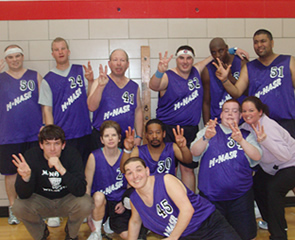 M-NASR also offers programs focusing on exercise, arts and crafts, cooking and sports, and we provide training opportunities for Special Olympic competitions. Please see the Special Olympics Section for more information on how you can become a Special Olympic athlete. Special events make up a large portion of our program offerings and range from trips to movies to vacation trips across the country. You will have the opportunity to go out to dinners and bars and even seeing some of Chicago’s best professional sports teams! We welcome your suggestions for a special event! Please contact us at 847-966-5522 for more information on our AWID area.